Bulk packs have always been the high point of any value seeker, specially when buying tobacco. Each 5 lb. bag comes in a thick, plastic, resealable pouch to ensure the contents inside stay fresh every time you use them. The secret to prolonging the life of this tobacco, and getting the most out of it, is to keep the bag in a dark, cool place like a closet or cabinet. This helps preserve the tobacco, and significantly prolongs its shelf life. An award winning tobacco with just the right balance of Menthol goodness. The flavor is crisp and refreshing but not overpowering. Unlike most other brands, Good Stuff chose to focus less on the mint flavor profile and more on a traditional bold Menthol taste. Smooth and consistent, this blend achieves exactly what you would expect from a high quality methol flavored tobacco. If you're a fan of a good menthol smoke, then look to further than Good Stuff Menthol. This tobacco is one of the best selling brands on the market for a reason; it's outstanding. Evenly cut with a consistent feel, each bag is carefully sealed to minimize shake. Manufactured by RSB Tobacco, Inc in North Carolina, Good Stuff Tobacco comes in a variety of flavors and sizes for every type of buyer. Whether you are a fan of menthol or natural flavors, there is a Good Stuff tobacco for you. Packed in convenient sizes, you simply can not go wrong. 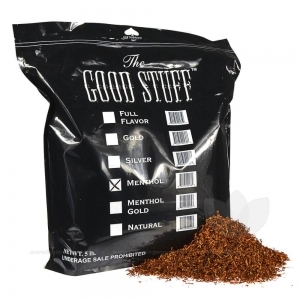 The Good Stuff is perfectly named as it is the best menthol tobacco available on the market for RYO aficionados. Firstly, it is an actual menthol tobacco and NOT the mint flavor, which I personally can't stand. I have been buying The Good Stuff for around 8 years after having tried many different types. In all of my years buying this brand, it has NEVER come dried out in any way. It is always perfectly moist and easy to smoke. The only negative is that the bag does tend to have some stems or longer pieces that are not suitable for smoking. After much trial and error, my suggestion to everyone is to use a standard kitchen blender on the highest setting, typically "liquify", and blend enough tobacco to fill about 1/2 to 3/4 of the blender. You will have to hold the blender in your hands while it is operating and tilt it back and forth and give it some small shakes in order to make sure that all of the tobacco is blending and that none of it is simply stuck at the bottom. You should also buy an air-tight container to store your freshly ground tobacco. I use the "Click-Clack" container which holds approximately 1 pound of blended tobacco. I use The Good Stuff with Top menthol tubes or Gambler menthol tubes, although Zen tubes are pretty good too. Never buy Premier tubes as they are cheap and rip very easily. 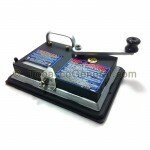 I also use the Powermatic 2 electric rolling machine because it is powerful and extremely durable. Lastly, I highly recommend buying the 5 pound bag of The Good Stuff menthol tobacco for approximately $54 because it lasts for well over 1 - 2 months and gives you the best bang for your buck, Sorry for the long review, but I love this tobacco and I wanted to pass on my experience to novice RYO users and offer everyone some tips on easy ways to roll the best possible menthol cigarettes. Thanks for the excellent prices Tobacco General! Happy Smoking!!! Good Stuff is GREAT Stuff. Not sure how many times I have ordered this brand now, but been buying it here for over a year now. Always comes in with the right moisture level and is easy to roll in my T2 rolling machine. I use this and the Shargio Red tubes to get as close to a Newport Menthol as I have been able to. I break the 5lb bag down into 5 one lb bags, keep one out to roll out of, and keep the other 4 zipped away in the original 5 lb bag. Works great for meand keeps my cost to below $1 a pack when I use 12 boxes of Shargio Red tubes. Made by Global Tobacco, these tubes incorporate the companies long standing as the leader in affordable quality tubes. Global Classic Filter Tubes come in just two varieties: King Blue and King Red. These great value tubes come with a 15 MM filter packed in even burning 84 MM paper tube. Consistently creates perfectly packed cigarettes. Choose king size or 100mm cigarettes. Heavy duty metal for long lasting use. One Year one-time limited warranty.